A bump in the road! I’m all better now 😉 so the last couple of days I’ve been trying to put together a post. For some reason, every time I sit down to write it, what ends up on “paper” is NOT even close to what I originally intended to write… it’s like my mind have an agenda on it’s own…!!! And guess what, the result is a bunch of unfinished posts! I’m coming to realise I might just have to let that topic, I’ve been mulling around, go… at least this time around, and maybe just write about something different, a lighter topic maybe? PS. How do you guys handle “road bumps” in your writing? Little did I know – 1 year of blogging! Would you believe it, today is my one year anniversary. One year! I’m sure for people out there, who have been at this for years, one year is nothing, and I get that. Hopefully I will be among those one day. But for me, here, today, one year of blogging is significant! So why is celebrating one year such a big deal? Well, you see, when I started out, I had this intention to blog for a year, but to be quite honest with you, I wasn’t really sure if I would actually manage to stick with it. I’ve tried journalling before and never succeeded (and I’ve tried several times), so why would writing a blog be anything different? But believe it or not, here I am, one year later, still posting the occasional words on my blog, and that’s why one year is such a big deal. Not only was I able to stick with it, but I’ve found that I like doing the occasional writing, and being part of a blogging community. Little did I know, when I started out, that this world of bloggers, would enrich my life, as they have truly done. This year, I have changed some of my ways. I’m sure some of this change would have come about any-ways, because of the journey I’ve been on the last few years. But there are no doubt that I have changed even more because of the blogging community. It’s funny, how when you start a journey, it’s like the universe align itself to help you out, and put the right people in your path. And that’s how it feels, one year in. Starting a blog seems to have been one of the better decision I could have made. Through my blog, I’ve met some wonderful and creative people, who’s writings I can’t help but to be influenced by. I’m really looking forward to continue this journey of mine, together with all of you, who so graciously have invited me into your “homes”. Without you, this blog would surely no longer exist! Last night I found out that I had gotten a wonderful mention from Laura over at The Next 50 Years. 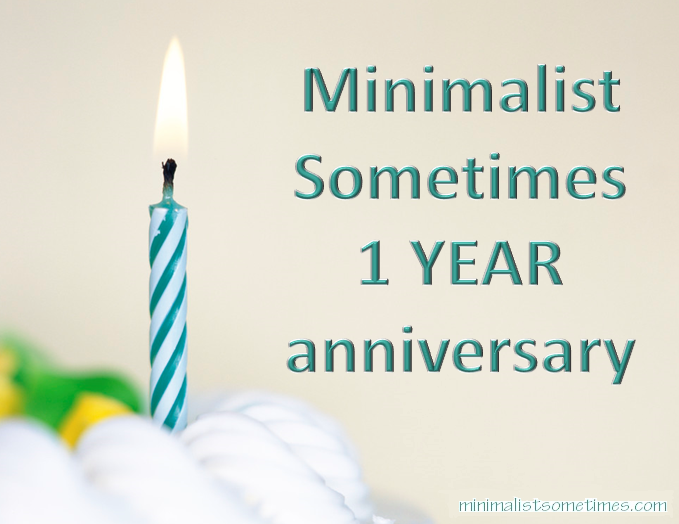 Saturday was her 1 year blog anniversary! Laura decided to honour some of her fellow bloggers, and could you believe it, she choose me first. I couldn’t believe my eyes when I saw it, I was completely floored, and honoured.. and did I mention floored? Not only that she would choose my blog, but also for her lovely words. You can read her post here. Laura found me December 23rd 2013, 10 days after I started my blog. She have practically followed me since the beginning. I love Laura’s outlook on life, how she embraces single living, how she completely nails it in some of her single living specific posts, how she makes me grin or even laugh out right.. and not to forget… she makes me think! Congratulations on your 1 year anniversary, Laura! I invite you all to mosey over to Laura at The Next 50 Years, for a looksie 🙂 Enjoy! With all these small projects I have going, you know… the photo collection, my dads boxes, DVD project and collection all sorts of stuff in boxes for my neighbour to have a look, before I get rid of them, my house is in shambles. Serious shambles! And I just can’t procrastinate any more (which I have done a serious job at the last couple of days), and today I just need to get it done. Do you ever find that you have so many things you are working on at one time, that you are suddenly overwhelmed with stuff? Well enough of that, I’m going to put everything back where it came from, clean up the place and start over, one item at the time, one box, one album! I might not have the same progress on the projects (you know – out of sight, out of mind) but at least I’ll have some piece of mind when I’m sitting in my living room.